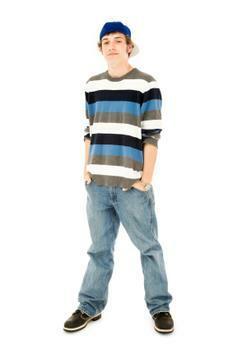 Men's wide leg jeans range from slightly wider than traditional jeans to very wide and baggy. They've been around for over a decade and don't appear to be on their way out any time soon. If you're bored with traditional straight leg or even skinny jeans, don't hesitate to give wide leg jeans a look; they're available at several price points, so there should be something for everyone regardless of their budget. Wide leg jeans for men have been around since the 1990's and don't seem to be going anywhere soon. They're baggy, but not all wide leg jeans fall off the waist and hug at mid-hip like some of the originals (and some of the styles are still popular a decade later). In many cases, the jeans are considered to be a hip-hop fashion, but there are some more subdued, less baggy styles that almost any man could feel comfortable wearing. They're only slightly wider and looser than traditional blue jeans. You can find wide leg styles with leg openings of 20 to 26 inches. Wide leg styles-especially those with the widest openings--tend to be most popular with teens and young adults. In most cases, the wide leg jeans have the traditional five-pocket design with zipper fly and belt loops. They're usually made from cotton denim and are of the traditional jean thickness, though some wide leg styles come in lightweight material. They're cut full through the seat, thighs, and legs, even in the least baggy of them all. Pricing, as with all jeans, will vary by designer. You could find a pair for as low as $19.99 in a department store like Sears, but if you're a fan of designer jeans, you can expect to pay the usual designer prices, sometimes over $200.00. It's rare to find a store that sells men's jeans without finding at least some version of a wide leg pair of jeans. All styles will obviously not be present in every type of store, however, so it may take a bit of shopping around to find the right pair for your wardrobe. Overstock comes in handy when you're looking for a new style. You can usually score a deal. eBay.com is another option where you can find a great deal if you have the patience to scout it out and wait until the perfect pair arrives on the scene. Who knows, you might be able to find a pair of the JNCO's that helped get the trend started. American Eagle tends to carry men's wide leg jeans in a more traditional, rugged style than the hip-hop pairs found elsewhere. DrJays.com could be your answer if you want the baggy, hip-hop look. Depending on just how wide and baggy you'd like them to be, you can pair them with anything from an oversized t-shirt to a polo or button-up. You can wear them with high-top sneakers or casual oxfords. Because the look has had time to evolve and branch into other styles, wide leg can be anywhere from preppy to hip-hop. Though the idea of men's wide leg jeans may conjure up images of the baggiest of baggy jeans, there are so many styles available with loose-fitting seat, thighs, and legs with wide leg openings, they're quite versatile. You can wear them with anything from a baggy t-shirt to a button-up, and they're likely to fit in anywhere jeans are appropriate. Having a wide range of price points to choose from makes it easy to select a pair, too.